There we are folks. On our wedding day. E L E V E N years ago today. Can you see the looks on our faces? That was sheer joy! We were so happy that day, to finally get married after almost 2 years of dating. There are not enough words to describe the feelings we both felt that day. We were surrounded by friends and family who loved us and supported our decision to be sealed for eternity. What a joyful way to begin our new life together! Congratulations on your anniversary! You are such a great couple and have a beautiful family! The years seem to get better and better! Jennifer, you have not aged. How do you do it? What a fun picture! Congrats! Congratulations on eleven years! That is awesome. Happy anniversary!!!! That is a fun photo. Congratulations!!! Happy Anniversary! I didn't know you dated for that long! You were so young when you got married, you look beautiful and very happy, just like now! Sooo cute; I remember that day! How much time has passed but not much has changed :) Congrats on your anniversary! I deleted my other posting! I've been to a lot of temple weddings and have never seen anything like that! 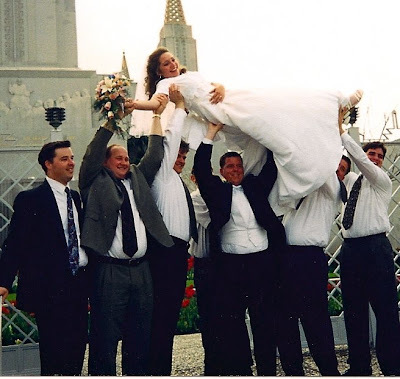 Yes, I've seen a girl's garments as the whipping wind blew up her entire skirt to expose those attractive bottoms, but I've NEVER seen a group of men lift a bride over their heads! Good show! And Jeremy--you done married well.